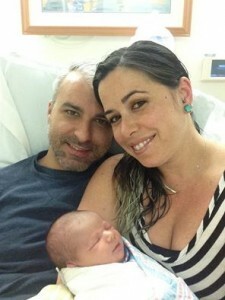 Thanks to Hypnobabies Instructor Amanda Ondricek for sharing her student’s birth story with us! Born: 5/20/16 right on his due date! I woke up at 5 am to a “squish”. I went to the rest room to see it was my mucus plug. Immediately I started to have pressure waves. I began timing them and they were 7 minutes apart. I thought, NO WAY!!! But I just went down stairs and began listening to my Hypnobabies Easy First Stage birthing track and they kept going and going. I called the midwives at 5:45 am and they said to come in immediately. I got to the hospital at 7 am and I was 6 cm dilated and 100% effaced!!! This whole time I was in center switch so I could be walking and talking and still very deeply in hypnosis. Things ramped up so fast I didn’t get the time to really focus to get into the OFF position. Our son was born at 8:16 am after 20 minutes of pushing and being switched around the hospital. A total of 3 hour and 16 minutes of birthing time total … start to finish. However it was calm the whole time. I was having an internal dialog with myself as to why I was feeling the way I was feeling. The only time I got panicked was when I was in a birthing tub for only 5 minutes. I thought to myself, this is transition and this is why I feel this way. As soon as my brain understood that, an overwhelming sensation to push came over me. It was literally that fast. This happened maybe 20-30 minutes after getting to the hospital. They pulled me out of the tub and brought me to the bed and it was confirmed I was 10 cm. so I was given the green light to push. However they told me they could to get a proper heart rate and it was concerning them. So they moved me to different room. Turns out he was fine, and we had a beautiful baby boy. My Birth Partner, Jason understood everything that was happening. He was such a great support. Hypnobabies gave Jason so much confidence to stop Nay -Sayers in their tracks. It felt like I had my own personal Bubble of Peace body guard. I loved it! Overall it was a positive and beautiful experience. I was able to have my baby naturally and without medication or complications. The midwife was even impressed with how calm I was even with the changing of rooms. I believe this was her first hypno-baby encounter. The other nurses were grateful I was an easy birth too.